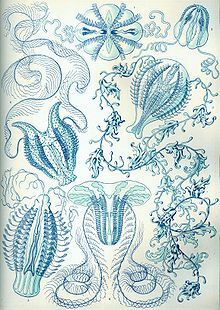 Ctenophora (singular ctenophore; frae the Greek κτείς kteis 'comb' an φέρω pherō 'carry') is a phylum o invertebrate ainimals that live in marine watters warldwide. ↑ Tang, F.; Bengtson, S.; Wang, Y.; Wang, X. L.; Yin, C. Y. (20 September 2011). "Eoandromeda and the origin of Ctenophora". Evolution & Development. 13 (5): 408–414. doi:10.1111/j.1525-142X.2011.00499.x. ↑ Stanley, G. D.; Stürmer, W. (9 June 1983). "The first fossil ctenophore from the Lower Devonian of West Germany". Nature. 303 (5917): 518–520. Bibcode:1983Natur.303..518S. doi:10.1038/303518a0. ↑ Conway Morris, S.; Collins, D. H. (29 March 1996). "Middle Cambrian Ctenophores from the Stephen Formation, British Columbia, Canada". Philosophical Transactions of the Royal Society B: Biological Sciences. 351 (1337): 279–308. doi:10.1098/rstb.1996.0024. This page wis last eeditit on 3 Apryle 2017, at 04:25.